*Amazon gift cards make the perfect last minute gift! I wish I could say that I was away on some terrific adventure, or that I have been so inspired to create magical dishes that I have been too busy in the kitchen with a knife in one hand and a spatula in the other to blog anything.... but, no. I have been just busy with life-things. Adult things, really. Like going to work and being super busy everyday, apartment hunting (which may be as much fun as bra shopping- ack), and thinking a lot about packing, cleaning, and making a giant Goodwill donation trip- but not actually doing any of it. Oh, I'm getting stressed just thinking about it. Part of my birthday package from my mother last month included a large stack of mail, and a container of M&M's shaped like the great state of Texas. I wanted to make cookies, but I didn't want to make cookies. I didn't feel like I had the patience to ball up all the dough and then clean several cookie sheets so I decided to dump the entire bowl of batter into my pie pan and voilà! Cookie pie. I'm not calling it cookie cake because I baked it in my pie pan. So there. Yum yum yum. I need these. I always get too impatient to scoop up the cookies so I dump them in the pan, too! Oh so delicious! I could eat cookie pie all day long. It would be better in a graham cracker or oreo pie crust! @Kayla Did you try GF version? What flour worked for yours? I want to try this tonight! I am so going to make it, vacuum seal it and send it to Afghanistan!!!! I did that same thing! If you freeze it after sealing and keep frozen until you ship, it thaws out during the trip. My friends were all amazed at how fresh it tasted! What a great idea to vacuum seal it. My brother is in Afghanistan and I have been wanting to send baked goodies but thought they would go stale. Thanks a bunch!! I just sent cookies to Afghanistan and put a piece of white bread in each cookie container :) the soldier I sent them too said the cookies were still fresh! Make sure it's in an air tight container! An aluminum pie pan would work just great! Cooking time should not vary- just remember when a toothpick comes out clean from the center it's done! Let me know how it goes at the party! This looks so good! My kids and husband would be all over this! Is it a little chewy or hard like a cookie? It's chewy and deeeelicious! :-) hope the hubby/kiddos love it! "3/4 cup butter softened (I used "light" country spread)" softened what? butter? We can this the "devil" in our house. Love to use the seasonal M&M's. Mmmmm!! Just got done making this and trying it..it was so yummy! My husband and I loved it! So glad you loved it! I couldn't stop eating it! :-) hope you'll stop by my blog again! Mmmmm, looks good! I think I am going to make it for my sons birthday this weekend. Think it would be good with a thin layer of icing so I can write on it? I wrote on here before, but I think I may have accidentally deleted my comment. Either way, I made it with a few changes, loved it. Turned mine pink, wrote about it on my blog, put a link on there leading directly to you. Thanks so much for sharing. I'll be doing this GF for my girls. Can I make this ahead of time and freeze it? Is there a way to make this in a jelly roll pan? would I have to double or triple it?? good question! honestly, I have never used a jelly roll pan, but if you try it out come back and let us know how it works! fantastic! how'd they turn out? My fiance isn't a sweet eater but he loves cookies. However I don't always have the time to ball up cookies and clean up all that mess. Trying these tonight. Can't wait! I bet it would be over the moon with ice cream on top!! Yum! I just put mine in the oven!!! Smells so yummy! I'm bringing it to a youth group meeting tonight and I'm sure it will be devoured. Just sampled it and it was way too dry. Maybe I'll add less flour next time. What temperature did you bake it at? I used a glass pie plate and turned the temp up to 350 degrees. After 15 minutes if baking I sprinkled M&M's over top of " pie" that I reserved from the 1 cup of M&M's I measured for the recipe. (About 20-25). Baking time was 25 mins. this looks yummy, and fun. My kids would love this too. i need to make this! Yum!! We buy a giant cookie for my husbands bday every year... Not after this! It was soooo much better!! What did I do wrong? Mine came out like soup?? Not enough flour maybe? I remember one year making Christmas cookies, my little sister wanted to make the Chocolate Chip all on her own, and didn't measure the flour right and it just melted and spread all over the pan! This seriously makes no batter. Not impressed. 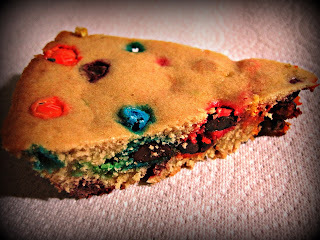 I just made this but replaced the M&M with chocolate chips and it was delicious! Family loved it!! It came out a bit crumbly, anything I should do differently?? Made it today for my fiance and I am incredibly disappointed. I have made many cookies and cakes from scratch and this was the first time a recipe did not turn out. The cookie came out way to dry and crumbling and it wasn't sweet at all. I don't know if you need more sugar and less floor but this ratio of ingredients did not make a moist gooey cookie like I was thinking it should have produced. Will not be using this recipe ever again!! Don't understand why some people are having bad results. I tried this for my family and they loved it! My twelve year has made it twice since and it came out great every time! Thanks so much for sharing your recipe!! Thanks so much for your kind words! :-) I'm so glad you and your family loved it. Feel free to come back any time for more recipes! Got mine in the oven now...we shall see how they turn out! Its missing the granulated sugar. Add some sugar and your adding extra yum! It kind of turned out like cornbread with m&m's. It was still good though. Next time I am following the nestle recipe and adding m&m's. I think it needs an extra egg and more sugar! Looks yummy... AND quick. My kind of recipe! Thanks for sharing. I'm wondering if those who say it is too dry are properly measuring flour. If you just scoop out your flour you are doing it wrong! Definitely easy to make however it had an overwhelming flour-y taste. (and yes, I measured it correctly lol) Texture and everything was fine but I couldn't get away from the flour taste. Is that normal? Are you sure you didn't put in any white sugar? 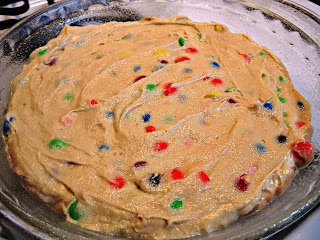 I know the flour helps it be more cake-like instead of a giant cookie but any bites without an m&m are just pure flour tasting - not cake tasting. I love the concept tho - any help would be great!!! I am 100% that I did not put any white sugar in. Brown sugar and M&M's are the sweet in this recipe. Did you follow the recipe step by step? Creaming the butter and sugar is super important, and altitude always makes a difference. Everyone's taste buds are different, so you might just want to experiment with leaving out the +1tbs of flour or adding more M&M's? Ok, so apparently I only thought I knew how to measure flour! lol ! I am a born scooper and honestly have never had a problem until now. Tonite tho I tried to make homemade choc chip cookies & surprise surprise - they came out too floury! UGH! So like a true baker, I googled my problem and now there's no more scooping! I am going to try your recipe tomorrow and will update my yummy results. Heck, I might even try it tonite since these cookies are a bust! Thanks for your patience!! Hey Jessica, how did it turn out the second time? Better luck, I hope? Ok I'm currently baking my second pie. :) My first came out amazing and I'm craving another!! I love the fluffy, cake-like texture. I don't think it has too much of a flour taste... It's just not drastically sweet. I love it! Thanks!! I made this last night for my son and it was incredible! My family loved it! Thanks! I can not wait to make this. I hate the greasy ones from the store. Thanks for sharing! Made this tonight and I'm very disappointed. It was too crumbly and there is definitely not enough sugar. Although I would probably make it again but with some granulated sugar added. It was still very moist. Make sure and use salted butter. Kind of blah without the salt. I just took mine out of the oven, cant wait to eat it! But I was wondering how it would taste if i put frosting on it.. what do you think? My daughter wants a cookie cake flower for her birthday. Is this cookie firm enough to remove from the pie pan and then cut into a flower shape and then ice??? Thanks! Hey, great question! To be very honest, no it is not. I bet the problem in that you use a spread in your recipie, not real butter....that really makes a differenct when baking!! I've tried once to make a giant cookie...giant failure. It was way underdone. This looks great and I love that one of the sugars have been omitted. I'm a little confused on the butter/light spread part. The recipe calls for butter. You had that you used a "light" country spread. When I see spread I think margarine..is that correct? I used white and dark choc, instead of m & m's. It is in the oven, smells and looks great! I will comment again with the result! I substituted mini Chocolate chips.. about 3/4 cup. OMG, it was so good!!! It's me again! I used the white and dark choc.. The tooth pick would not come out clean, so I kept it in the oven, and after 30 mins, it looks over cooked! Not sure how it turned out taste wise, I'll check back here after dessert..
What is the proper way to scoop flour? The biggest mistake people make is scooping the measuring cup into the flour. To properly measure flour, you should lightly spoon the flour into the desired measuring cup until it is over flowing. Then, gently use the back of a butter knife to level it off. Scooping into the flour can cause up to 25% more flour than your recipe calls for! Hope this helps anyone that needs it! Its me who used the chocolate to sub the m&m´s. I poured milk on it when I saw it looked over cooked. It turned out good, but the middle was soggy. My fault! I will probably make it again though but with no milk! I'm making this tonight for my mom's birthday. I'm SOOOO excited to try it!!! And I love that there's no sugary frosting to add calories. Probably actually a very smart alternative to cake! If your cookie pie didn't turn out perfectly, clearly you are doing something wrong in the process. I have made this 7 times in the past 2 months (clearly, we are big fans) and it turns out great every time. Yum yum yum, thank you for sharing this recipe! Wow! Thank you! I don't think I've even made it that many times! Lol I'm so glad y'all are such big fans! I think 3/4 cup of butter is waaaaaaaaaaaaay too much...tasted like I was eating a stick of butter. Next time I will use 1/2 of butter and see how that tastes. I made this with chocolate chips instead since that is what I had on hand. Delicious! Looking forward to making this with M&M's next time. Oh, and I had to substitute applesauce for the butter because I didn't have enough butter (live out in the country and can't run to the store). I used 1/4 C butter and 1/2 C applesauce and it came out great. Can I substitute self rising flour instead of AP? Oh my! This was delicious!! I just made it because I had a craving for m&m cookies and for funfetti cake, so I combined the ideas. I used your recipe with m&ms and sprinkles, it was fantastic! I plan on adding your idea and picture of my final outcome to my blog! Thanks for the recipe! What's 325 in English cooking? It was awesome, making if for the second time tonight. The first one was eaten by everyone at work ate it in about 20 seconds. So, I was thinking tonight that I wanted cookies, but had no desire to scoop out tons of cookies. I was on pinterest and this was one of the first pins I saw tonight! So I decided to give it a try. However, my dyslexia (and possibly the fact that I was in a bit of a hurry :/ ) made me misread how much flour. Somehow, I saw 3 cups, instead of 1. Luckily I measured the flour and baking soda into a separate bowl first. I had added a bit over a cup and started mixing when I noticed my mistake. The dough looked really, really dry, so I slowly added some almond milk until it looked like it was the correct consistency. It's currently in the oven and I hope it turns out good! Can you use a metal pan? I just tried this and its amazing! Its like a really good buttery cookie, but fluffy (cake like). Its really good! Thank you so much for the recipe! I'm making this for my mom's 50 birthday and am really excited but wanted to know if I use unsalted butter or salted? Or do I have to use margarine? I used a "light spread" which is margarine. I have made it using butter (unsalted) and it turned out just as yummy! Happy Birthday to your mom!! I made this tonight and I thought it was really good. Mine turned out nice and soft. No problems with too much flour or tasting like there was too much flour. I will be making this again! can this be made with choc. chips instead of m&m's? This was AMAZING!!! Made it with Rieces Pieces. Will definitely be making this often~~~THANK YOU! Thanks so much for linking up. Nothing better than and pie and cookie in one! Are you supposed to use 1 cup of flour + 1tbsp or is it either or? Sorry, first time baking anything. I made this again tonight with walnuts, semi sweet chocolate chips and butterscotch chips.....amazing! Thank you so much for this easy, wonderful recipe! I just made it for my friend's birthday. I do feel that you can easily taste the butter, so using less might help, but overall, it was great! What if I wanted to make cookies with this recipe? Instead of putting in a pie pan scoop balls onto a cookie sheet, would this work? My boys and I just finished making this for Santa tonight. Super easy recipe for young bakers. Could you bake it in a cast iron skillet? I'm sure you can... but I don't know what to tell you about cooking time, I have to imagine that cast iron would alter it a bit. I made this recipe tonight. I made a slightly smaller pie and then four minis in my brioche tins. The dough was slightly less sweet than I'd have preferred, but with so much chocolate it didn't matter much. I did omit the extra tablespoon of flour, and also the baking powder since I used self-rising flour. Thanks so much for sharing this recipe - once I have it blogged, I'll link back to you. I'm thinking about reducing flour, adding cocoa, and using mint m&ms ;) Will post results! Just made this & it came out so good! Next time I will add more m&m's though;) great recipe!!! do i have to use a mixer to blend the ingredients? or can they be mixed together with a wooden spoon? This cake is awesome and so easy! I'm only having one issue, all my M&Ms fall to the bottom during bake and kind of make a crust...any idea why? Your cake looks like they stayed throughout! gonna make this for my small group at church! cant wait! Oh my gosh! It was soooooo easy to make and turned out awesome! I made it when we were snowed in, so I used what I had on hand and put in chocolate chips and reeces peanut butter chips!!! I didnt have any problems, it was easy with minimal ingredients. I will definitely be making it again! Ive made three since finding this! My boyfriend loves it! In fact, I have one in the oven as I type this. I am making this for my daughters 6th birthday. It's for her to take to school to share with her classmates. Can't wait to try some myself! 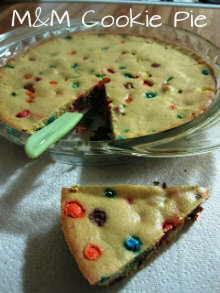 I have to try this cookie pie and soon. I am so curious about the taste! Just took it out of the oven and it looks great. Taking with me when I visit my daughter at college tomorrow. Thanks! Tried it this morning and came out flour-y tasting as well. Stupid question here but I want to make it right- light brown or dark brown sugar? Thanks!! I'm guessing white granulated sugar can't be substituted for the brown sugar? Made this for family dinner as the dessert. It lasted about 15 seconds and in between the omg this is good I heard a thanks. This is going to be a HIT at my Scentsy party Saturday! I will even share your Link with my attendees :) Yey for inexpensive and easy party snacks! Made this for game night, the center was moist and the crust had a cookie like consistency, a little crumbly. Served cookie dough ice cream on top. It was a big hit! Thank you for sharing.